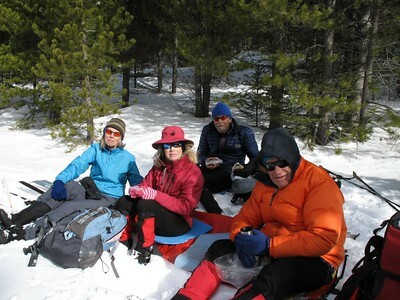 It has been awfully warm, and windy as hell overnight, and Kerry was sporting some major tendonitis in one hip, but five of us decided to go for it anyway. 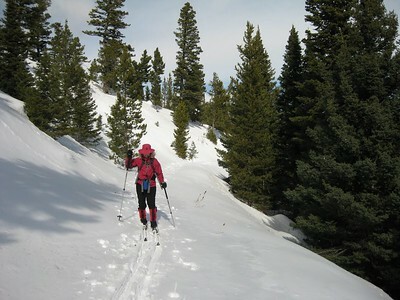 Susie and I have skied what we refer to as the Figure 8 in the Brackett Crk drainage in the Bridgers many times (eg: https://picasaweb.google.com/twohikers/MiddleNorthForkBrackettCreekLoopSki#) , but it has great scenery and interesting terrain, so why not give it a shot. 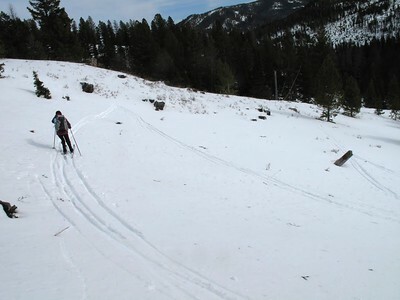 This day, while the wind was a bit annoying, the biggest challenge was exceedingly variable snow conditions. 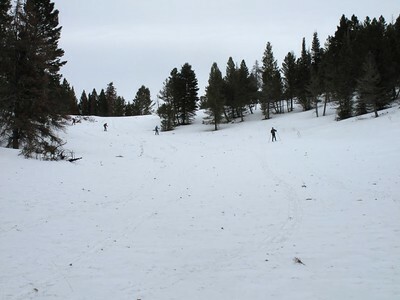 The wind was howling thru the venturi formed by the combined Brackett Creek drainage, so we walked a bit further than the gate to get our skis on. Left to right are Susie, Kerry, BJ, and Donna (red gators). 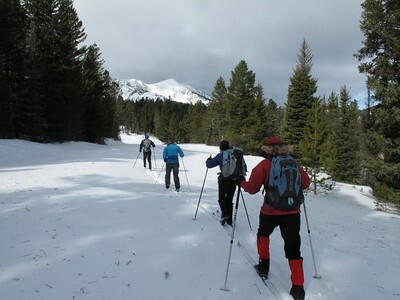 The first part of the route offers nice views of Ross Peak in the Bridgers. It also offered very hard packed snow. A few minutes after this photo was taken, about 300 meters up the trail, we were standing around chatting, looking at a meadow, and a wind gust blew Kerry off her feet. 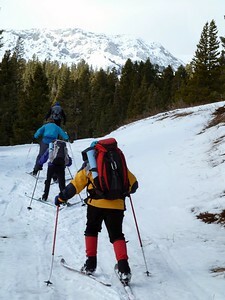 We finally got out of the hard pack further up the North Fork. Some nice views of Naya Nuki, and less wind. 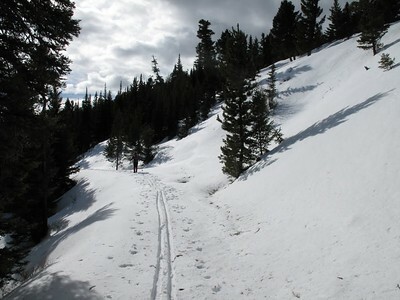 A bit over 2 miles up the route, there is a spot where the snow is steep and thin. Herringboning is always in order. 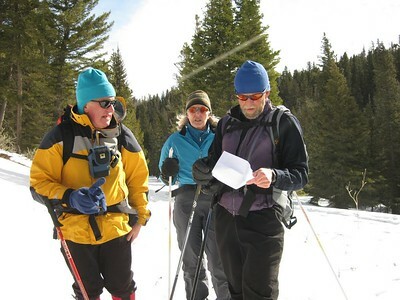 Roger, Kerry and BJ discuss the route. 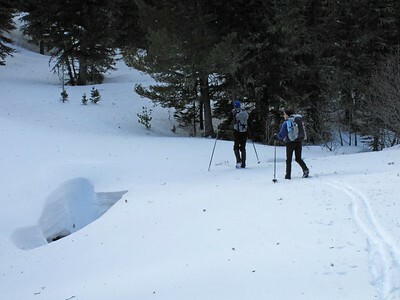 There is usually a nice snow bridge to cross what one might refer to as the South Fork of the North Fork of Brackett Creek. This year, it is biggest we have ever seen. 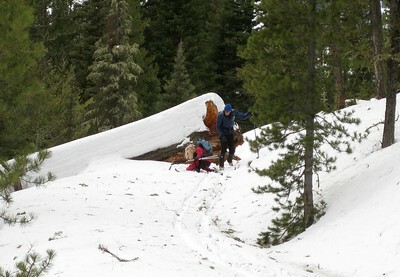 Here BJ and Susie "check out" the integrity of the snow bridge. 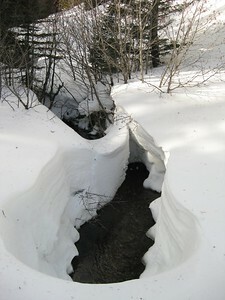 From the snow bridge, the creek looks a long way down. 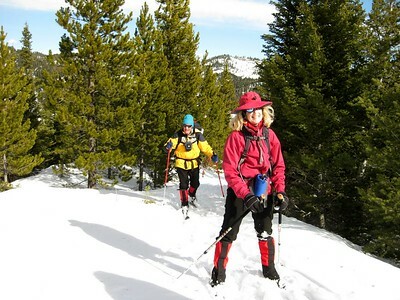 Continuing to climb in the sunshine along the South Fork of the North Fork are Roger, Kerry, and Donna. 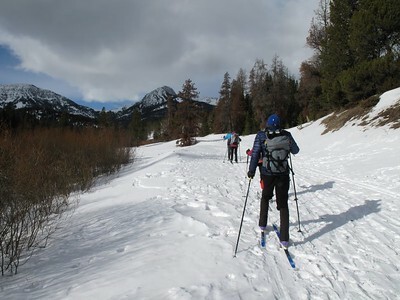 After a climb thru lovely powder, the route makes a hairpin turn and climbs steeply up to another old road bed. Some herringboning helps. Here Roger and Donna catch a breath after the steep pitch. There is one spot along the route where the terrain above is avalanche-able, so we always do the 200 meter stretch one at a time. Donna finishing up the stretch. It took us 2 hours of hard skiing to make it to lunch. Here Kerry, Donna, BJ, and Roger are happy campers. Finding a spot with some shelter from the breeze and a view was not too hard once we got to saddle. Not the primo lunch spot, but the breeze made such less inviting. This time, busting thru the trees on the saddle was not too hard, because we were able to find the exact route we used the first time we skied this. 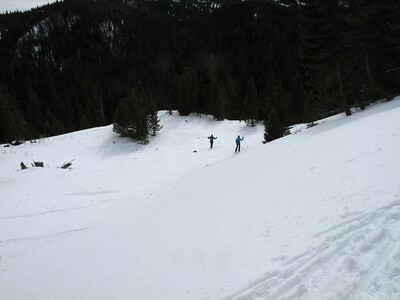 But skiing down crusty snow on a south facing slope proved to be a challenge. Lots of kick turns and a few falls. 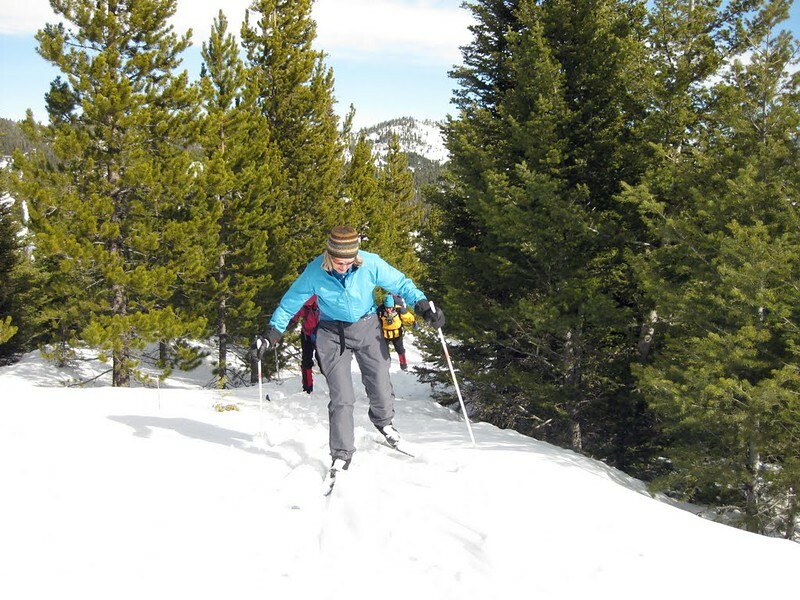 Here Susie skis along a descending traverse down the hill. Roger is just getting up from a fall while Donna descends past him. You can see the switchbacks in the crusty snow to the right of Roger. 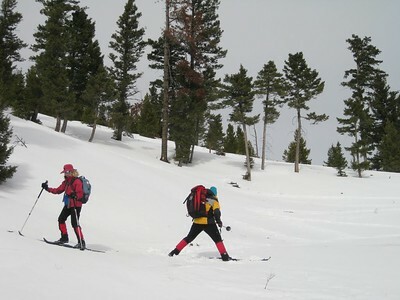 OK, down the first big slope and down a steep road past where a huge tree (https://picasaweb.google.com/twohikers/MiddleNorthForkBrackettCreekLoopSki#5185188506464985154 ) used to stand. 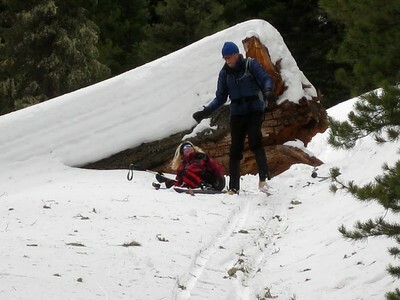 The snow was tricky, and Donna fell. Here, BJ skis down to help her. A close up of BJ getting ready to provide a helping hand. 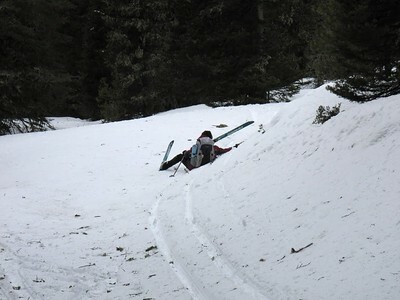 Down thru the woods across more steep icy snow, and Susie takes a dive. Ah, but all in the course of having fun. 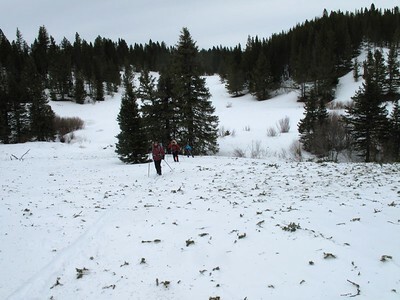 Down a big meadow, descending to a crossing of the Middle Fork of Brackett Creek. It was good for a couple more falls. 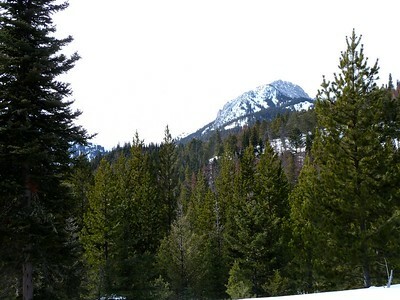 OK, we descended the meadow behind the two trees in the center of the photo, crossed a couple of snow bridges, and are climbing up to the old road down the Middle Fork. All the branches in the snow are a result of high winds the previous night. By this time, the winds have pretty much died down. 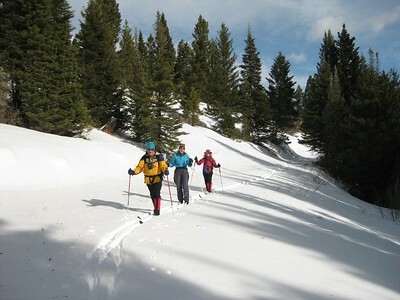 A good ski, but challenging snow.